Seen: Rep. Dennis Laogan of Ang Kabuhayan Partylist visited Bohol on Friday (Sept. 28). Laogan introduced the Negosyo Caravan for cooperatives and micro, small and medium enterprises (MSMEs) as well as the P3 program that will serve as an alternative source of fund for the underprivileged entrepreneurs in Bohol. The “Pondo sa Pagbabago at Pag-asenso” (P3) was introduced by Pres. Rodrigo Duterte to help business of the underprivileged entrepreneurs grow. “This P3 program is one way to combat the 5-6 loan sharks,” Laogan told Bohol reporters. Laogan, the chairman of the House Committee on Small Business and Entrepreneurs Development, is the youngest representative in the country. He officiated the oath of office of then Speaker Pantaleon Alvarez and the newly installed House Speaker Gloria Macapagal-Arroyo as a tradition that the youngest congressman will administer the oath of the speaker. Laogan was accompanied by Benjie Oliva, the acting Cooperative Development Authority (CDA) chairman of the Board of Administrators, who at 36 years old is the youngest person to have held the highest post of the regulatory body. Scene: Red Tide Alert: In its shellfish bulletin no. 25 dated Sept. 25, the Bureau of Fisheries and Aquatic Resources (BFAR) warned that the coastal waters of Dauis and Tagbilaran City in Bohol province are still positive for paralytic shellfish poison (PSP) based on the latest laboratory results the bureau conducted. All types of shellfish gathered from the said areas are not safe for human consumption. Siblings Gerwin and Jan Vier Yudelmo went home to Inabanga town in Bohol to witness the town’s “Christmas tree lighting” ceremony on Saturday night, Sept. 22. Yudelmo, 28, a call center technical representative in Cebu City, said he didn’t want to miss Christmas celebration which came early to his hometown. Residents and tourists gathered at the town plaza to witness the spectacle of holiday lights, fireworks, live music and a tree-lighting ceremony. Yudelmo said the town plaza infront of the town hall which sparkled with glowing lights melt their hearts. “We are happy that our municipal plaza is full of Christmas lights because since the earthquake in 2013 up to the Abu Sayyaf siege, finally Inabangnons are able to celebrate Christmas without fear,” said Yudelmo. “And for that it’s a merry, merry Christmas,” he added. Inabanga was one of the towns severely damaged of the 7.2 magnitude earthquake which brought Bohol to its knees in 2013. Still recovering from the aftermath of the quake, four years after at least 10 members of Abu Sayyaf, with the help of an Inabanga native, entered the town and tried to set up a base there. The celebration was a manifestation that the town had moved on. There were 21 Christmas trees and 100 parols (star-shaped Christmas lantern). The highest Christmas tree measured 20 feet. The materials made out of indigenous materials. They used bamboo slits and dried “kabkaban” leaves that grow on the barks of trees that are abundant in the place. Inabanga was the first town in Bohol to celebrate Christmas so early. 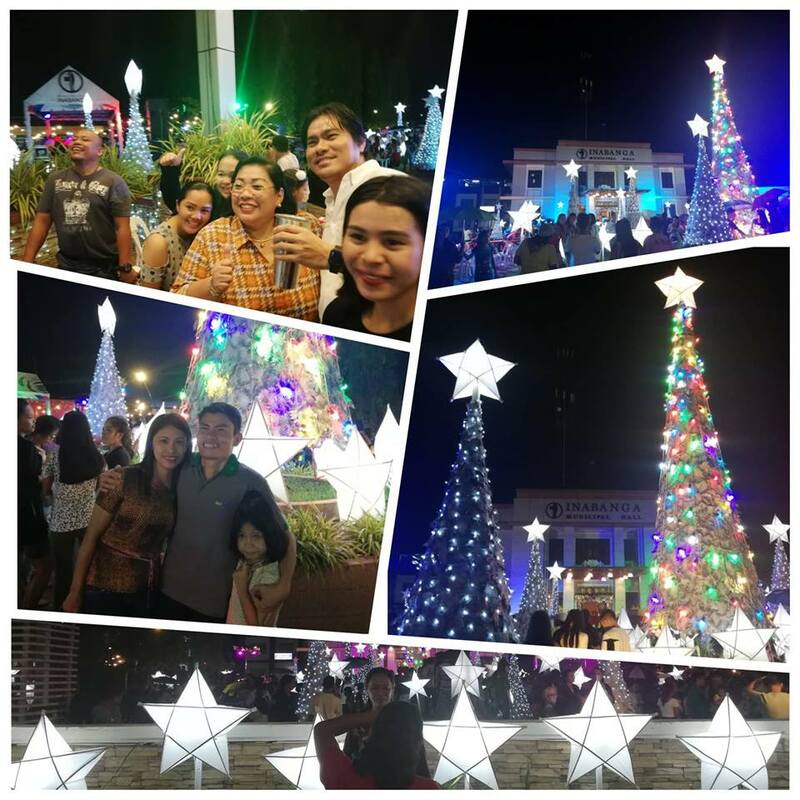 But for Mayor Josephine Socorro Jumamoy, the Christmas celebration was more than the vibrant Christmas lights illuminating the plaza. It was dedicated to persons with disabilities (PWDs). “Why so early? It’s because TEAM Inabanga wants to create an atmosphere for the spirit of Christmas. It is really our direction for the PWDs, for the persons with disabilities, that we can help them out,” said Jumamoy. Bebencio Balaga, a resident of Barangay Ubujan, expressed deep gratitude for the new wheelchair given to him during the event. He was among the six beneficiaries who received the wheelchairs. Others were Dominador Boiser (Lapacasan Sur), Cyrell Namocot (Dagohoy), Jocery Luzon (Lawis), Mark Vincent Delos Santos (Poblacion) and Rey Acupinpin (Tungod). Acupinpin said he felt special since the Christmas celebration was dedicated to them. The Christmas display aims to bring back the Inabangnon to the meaning of Christmas as it upholds faith and resiliency. Your VRS asked Mayor Jumamoy for her plans in 2019 elections. She said she wants to stay as mayor. “I would like to continue working for Inabanga as Mayor,” she said. Inabanga, the hometown of Francisco Dagohoy who led the longest revolt in the country, is also popular for its weaving industry, producing crafts sold locally and abroad. A single tree offers a burst of green, a cooling canopy and an antidote for frayed nerves. But we need more trees to improve air quality, provide shade, offset climate change, reduce stress, and make people happy. That is what the Alturas Group of Companies (AGC), a local multinational company in Bohol province, has been aiming to do. On Sept. 9, employees and volunteers planted more than 500 trees on the first day of AGC’s “Plant A Million Trees,” a record-breaking environmental drive in Bohol province—a starting point in the million trees campaign in making the province and the world more sustainable. Through its Alay Marcela Foundation and volunteer group Alta Citta, the AGC aims to plant and grow one million trees all nothing but for the sake of the environment and food security. The provincial environment and natural resources office (PENRO) and the Dioceses of Tagbilaran and Talibon, which are both actively participating in many other tree planting activities, are coordinating the said activity. Trees are important to the environment through their ability to absorb carbon dioxide and lower ambient temperatures. They also contribute to the overall health of communities, wildlife and aesthetics. During the launching last Sept. 9 in Panglao island, Bishop Alberto Uy of the Diocese of Tagbilaran blessed the first 500 seedlings after a holy mass and joined with the Alturas Vice President and General Manager, Marlito C. Uy, for the ceremonial tree planting. Uy said the activity was “for God’s glory and for the good of humanity” as this is for the best interest of not just the environment but mankind in general. He hopes other multinational companies like Alturas will follow suit. The AGC, which operates two malls and three super stores in Bohol; and two Colonnade supermarkets in Cebu, and twenty more subsidiaries, will tap its vast manpower from its thousands of employees, customers, business partners and more in planting the trees. Still, planting one million trees wouldn’t be easy. To meet the goal of planting a million trees, Alturas had already identified all those possible areas for the year-round tree planting; and the DENR PENRO is very committed with 100 percent assurance to produce and provide the needed thousands of seedlings. Anyone can also exchange a tree seedling for P10 at Alturas. Likewise, Alturas plans also to produce its own nursery for the seedlings. This September, thousands of tree seedlings were already planted in Lourdes, Cortes; Tabalong, Dauis; and San Pascual, Ubay. More will be planted in Untaga, Alicia; and the coastal areas of Panglao.